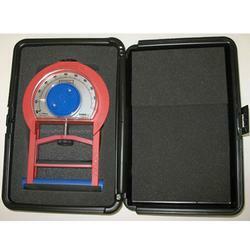 The T-18 TKK Analog Grip Tester is the most widely used hand dynamometer in the world. It is the most accurate with an accuracy of +/- 2 kg from 5 to 100 kg with a resolution of 1 kg. Holds the highest reading with an easily resettable pointer. Pointer is protected beneath the lens. Very durable and reliable. Includes padded hard case.